Exercise is a cornerstone of treatment for diabetes, but for years patients with peripheral neuropathy have been dis­couraged from weight-bearing exercise for fear of further increasing ulceration risks. Now new research is turning that advice on its head. Those investigating alleged improprieties associated with a 2007 study on hip protectors will tell you their efforts are all about ethics. But the way I see it, the more important lesson to be learned from this situation is one of biomechanics, specifically the clinical importance of the subtleties of asymmetry. 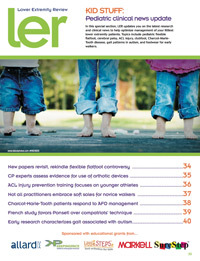 In this special section, LER updates you on the latest research and clinical news to help optimize management of your littlest lower extremity patients. Topics include pediatric flexible flatfoot, cerebral palsy, ACL injury, clubfoot, Charcot-Marie- Tooth disease, gait patterns in autism, and footwear for early walkers. In January 2010, when LER first covered the controversy, Australian podiatrist and researcher Angela Evans, PhD, had recently published a paper in the Journal of the American Podiatric Medical Association suggesting that children whose feet were flatter than expected, but asymptomatic, should be monitored rather than automatically treated with orthoses. The January publication in NeuroRehabili­tation of the recommendations from a consensus conference held in 2008 paints a less-than-perfect picture of the evidence underlying orthotic management of cerebral palsy (CP). Training programs aimed at preventing anterior cruciate ligament injuries have been used for many years, but injury rates remain high. Injury prevention experts suggest such programs may be more effective if implemented before children reach the ages associated with highest injury risk and if the programs utilize age-specific protocols. Barefoot is a biomechanics buzzword these days, but not all practitioners believe soft-soled shoes are best for very young children, even if such shoes do approx­imate the barefoot walking experience. Muscle weakness and instability associated with Charcot-Marie-Tooth disease in children can be addressed with ankle foot orthoses, research suggests, but practi­tioners should be aware of the limitations of AFOs in this patient population as well as the ever-present challenge of compliance. In a comparative study published in the April/May issue of the Journal of Pediatric Orthopaedics, French researchers found that Ponseti casting compared favorably to French physiotherapy for initial treatment of idiopathic clubfoot. Little research has been published about gait patterns in children with autism, but that could be changing. One recently published study, although small, appears to lay the foundation for more focused research and could have clinical implications as well. In the ongoing battle against inversion ankle sprains in basketball and other sports, high tops are old news. But shoe designers have begun to investigate other ways that shoes might play a role in preventing sprains rather than contributing to the problem. The medical literature generally supports the use of foot orthoses for management of plantar fasciitis symptoms, but evi­dence regarding specific orthotic designs is inconclusive. Early research suggests a temporary custom foot orthosis may be an effective treatment option. Previous research has identified superior balance in professional golfers compared with controls as well as associations between balance and skill level in amateur golfers. This study compared standing balance characteristics between profes­sion­al and highly skilled amateur golfers. New England Baptist Hospital’s multi­disciplinary prehabilitation program is grounded in research suggesting that outcomes after total joint replacement can be positively influenced by preoperative care that includes management of patient expectations as well as exercise.